Our fees are all inclusive so no additional costs. We accept all childcare vouchers and offer 3-5 year old funding. Our spaces fill quickly, so we recommend you enquire as early as possible to ensure you get the sessions and start date you require. * Terms & conditions apply. Contact us for more information about our fantastic discounts. Our preferred method of payment is via direct debit or paying online. 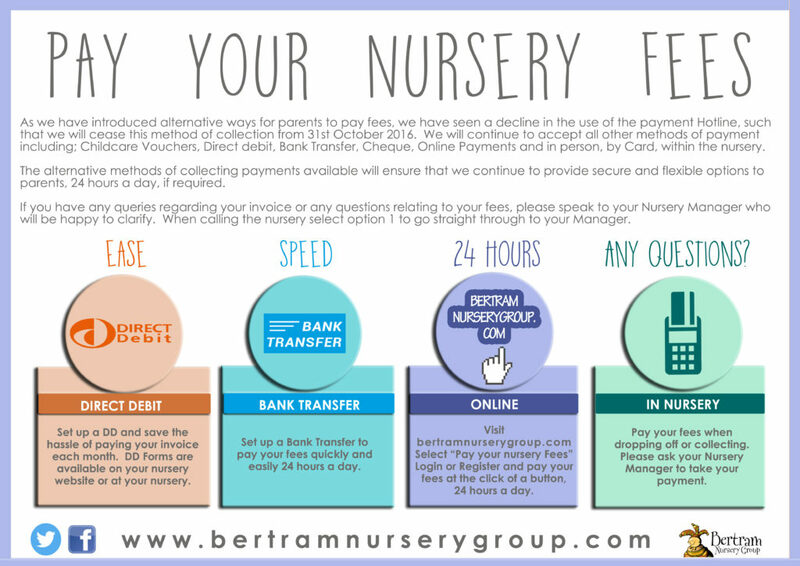 Loretto’s parent company, The Bertram Nursery Group, accept payment for fees for any of its nurseries online. We are pleased to work in partnership with East Lothian Council to provide funding for 3-5 year olds. Please contact us from more information, or book a viewing with our manager to discuss what options of funding are available to you. If you’re a working parent, you can open an online account to pay for childcare. The government will top-up the money you pay into the account. For every £8 you pay in, the government will add an extra £2. You can receive up to £2,000 per child per year. You, and any partner, must each expect to earn (on average) at least £120 per week (equal to 16 hours at the National Minimum or Living Wage). If you, or your partner, are on maternity, paternity or adoption leave, or you’re unable to work because you are disabled or have caring responsibilities, you could still be eligible. If either you, or your partner, expect to earn £100,000 or more, you can’t get Tax-Free Childcare. You can’t use Tax-Free Childcare at the same time as childcare vouchers, Universal Credit or tax credits.